"The Outbursts of Everett True...was a two-panel newspaper comic strip created by A.D. Condo and J.W. Raper that ran from 1905 until 1927. Two contemporary collections appeared in 1907 and 1921. When one of the collections was reprinted that year, comic-book writer Tony Isabella and various artists employed the character in a new strip for The Comics Buyer's Guide and The Comics Journal. In this modernization, True directed his outbursts at comic book artists, writers, publishers and distributors. 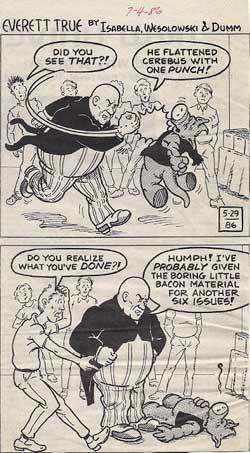 "The original strip revolved around a portly, ill-tempered man who was invariably dressed in a suit and bowler hat of antiquated and comical appearance for the time. The first panel of each strip generally had someone inconveniencing or annoying True. In the second panel, True exacted his revenge by either berating or (if confronting a man) pummeling the offender." Though I had always intended to share some of my old Everett True cartoons with the readers of this column, my intentions never amount to action...until now. My parents have been going through the newspaper clippings, photos, report cards, and such that have been accumulating in their home for half a century. They recently gave me several binders and boxes of this stuff from the life and times of your Tipster. It's a little bit daunting and a whole lot frightening to see these lovingly preserved artifacts for the first time in decades. Yow! There were clipped Everett True cartoons among those excavated treasures. Though I followed the traditional two-panel format of the original Condo/Raper cartoons when I started writing these, it didn't take me long to add some much-needed variety. The cartoon shown above was created in May of 1986, and published in the July 4 edition of CBG. It was penciled by Ed Wesolowski, a young artist who was working in my Cosmic Comics store at the time, and inked by Gary Dumm of American Splendor fame. I must confess I don't remember the "why" of this particular cartoon. Dave Sim was doing "Church and State" in Cerebus and this was years before his lunatic he-man woman-hater material would drive me from the title. I didn't think "Church and State" was as good as "High Society," but I don't remember disliking it as much as this cartoon seems to indicate I did. I do plan to reread and read Cerebus from start to finish in 2011, so maybe that will jog my memory. I'll be running more Everett True cartoons next week. If you like them, let me know. If you really like them and if that translates into "Tip the Tipster" donations that would allow me to pay an artist to draw them, I'll write new ones. For that matter, if any talented members of the loyal legions of TOT readers want to create their own Everett True cartoons, send them my way and I'll print them here or on my message board. I tend to get both reflective and optimistic at the start of each new month. There's probably some multi-syllable designation for this state of mind. Feel free to enlighten me. The optimistic half of my psychosis need not concern us today. With my daughter Kelly graduating from high school on this coming Sunday, I'm thinking a lot about the little girl who has grown up into the beautiful young woman she is today. 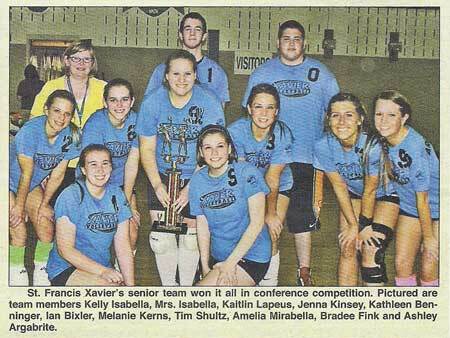 Kelly's CYO volleyball team - the Saint Francis Xavier senior team - won their conference. The team was coached by Sainted Wife Barb with considerable assistance from Kelly, who was also one of their team's strongest players. 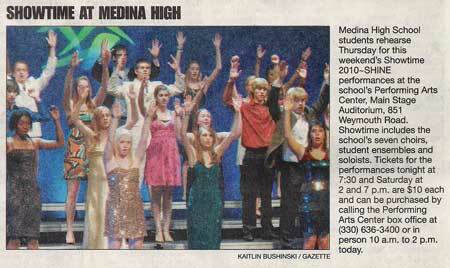 This past weekend, Kelly and close to a hundred other Medina High students, sing and danced their way thought four performances of Showtime 2010: SHINE. I have no idea how well the above photo will reproduce here, but Kelly is directly behind the young lady in the shimmering green dress. I saw the show on Saturday and thought it was great fun. As a member of the school chorale, Kelly performed in several numbers. The number that got to me was when the senior ensemble sang "In My Life" with a backdrop slideshow of the graduating seniors as young children. I confess I was a little misty when Kelly came out for "What a Wonderful World," the show's closing number. It was a good way to end Kelly's time at Medina High School. She graduates this Sunday and, a few weeks later, we'll be having a party for her at Casa Isabella. Come fall, she'll be attending The Ohio State University with her brother Eddie. Between now and the party, three major household projects must be completed. If you remember my columns on the "Contractor From Hell" who built the addition to our home around five years ago, one of the projects is repairing work he did badly and which is still under a warranty he refuses to honor. We're having the work done by friends of ours and, once we're past the party, we'll decide if we're going to sue our former contractor. Another of the projects, a very loud project, is taking place around ten feet from my office. I ask only that my beloved readers cut me slack for any typos that creep into TOT. My creative plans are on hold until after Father's Day. It's possible I'll have more to say about them then. In the meantime, I do thank you for the notes of encouragement you continue to send me. They are greatly appreciated. Prior to its Monday posting, I shared my Memorial Day column with several professional friends. One of them, Nat Gertler, took exception to the column. Though I don't agree with Nat's comments, I felt they deserved an airing here. I'm sorry, Tony, but as much as I agree with you that homosexual service members should no longer be forced into the second-class status that they have suffered for so long, this article and this argument is not appropriate. It is a co-opting of the dead, claiming them for your side, claiming that their sacrifices were for what you believe in regardless of how they felt. I don't like that technique when it comes from the other side, when we are told that we have to continue a wrong war because of those who already died, as if they were the ones who had decided for the war, rather than merely answered the call of their country. If it's an unfair technique for those I disagree with, it's an unfair technique for those I agree with as well. We need to honor the American servicepeople who died not because they agreed with us, but because we asked them - and often *forced* them - to put themselves on the line for our nation, our people, and thus we owe them dearly. We already used them for whatever our cause was at the moment we had them on the line, taking that from them. Few wanted to die, though they may have been willing. We should memorialize them first and foremost not because of their greatness - although many were great - but because of our responsibility in what befell them. To use them again, co-opt their memory for our politics of the moment, is unneeded and wrong. Those people fought for many reasons - some for money, some for country, some because they were forced to. Even those who fought for country may have had very different visions from yours as to what this country meant, a freedom of belief that we should respect. If the polls of service members made during the relatively brief period that we've been struggling with this question are any indication, it is likely that a large portion of them were in specific disagreement with the point you raise. Memorial Day is a fine time to raise the point that we've had many, many gay soldiers who served honorably and gave the ultimate sacrifice even as they were made the focus of cruel and unequal treatment by the very nation they were fighting for. We can grant them the extra dose of respect that we grant, say, the Tuskegee Airmen. But to paint changing the policy as being somehow what all who died were fighting for is not accurate, nor appropriate, nor likely to convince those who need convincing of the righteousness of our cause.